Harvestmoon Brewery is a brewery based in Maihama, Chiba. If that place sounds familiar then you probably know it because of DisneyLand and DisneySea literally just round the corner from it. Ikspiari Town is a busy shopping area and Harvestmoon Brewery also have their own tasting room as well, called Roti’s House which houses the brewery. To confuse matters even more, the company that owns Disneyland also owns Roti’s House which owns Harvestmoon Brewery. Harvestmoon Pale Ale – An English style pale ale brewed using hops and malt imported from the UK. Harvestmoon Brown Ale – An American style brown ale brewed using imported hops from the USA. Harvestmoon Schwarz – A German style beer that has won numerous awards around the world in its class. Harvestmoon Pilsner – Brewed from a Czech recipe using Czech and German hops, this is another award-winning beer from Harvestmoon Brewery. Harvestmoon Belgian Wheat – Typical Belgian wheat style beer but has the adjuncts of orange peel and coriander added during the brewing process. Harvestmoon Brewery has a wide and varied selection of beers throughout the year. Trying to keep up a list is not possible due to some of the batches being one offs rather than annual or seasonal brews. 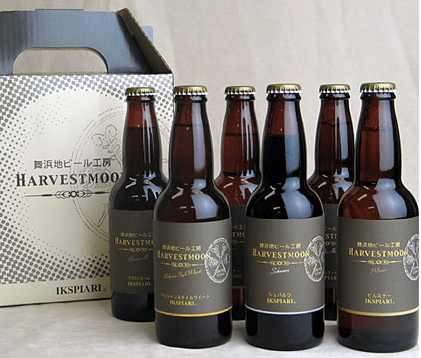 Harvestmoon Barley Wine – an 8% barley wine from Harvestmoon that is part of their autumn line up. Harvestmoon Black Barley Wine – an 8% black barley wine from Harvestmoon that is part of their autumn line up. Harvestmoon Christmas Porter – a 5% winter seasonal porter from Harvestmoon in Chiba. Harvestmoon Il Limone del Diavolo – a 5% fruit beer and it is part of their autumnal range of beers. Harvestmoon IPA – a 6% American IPA brewed with three different kinds of imported American hops. Harvestmoon Smoke Ale – a 5.5% rauchbier from and is part of their summer line up of craft beers. Harvestmoon Valentine Stout – a 7% stout beer packaged only with a special label. Harvestmoon Yuzu Ale – A 4.5% fruit beer / radler that contains locally sourced yuzu from Japan.